Today we revisit Carcassonne “La Cité” and see the sites we missed last evening. Then a drive to the remote Cathar castle ruin of Peyrepertuse. It’s late morning and the tourists are filling up La Cité (the medieval fortress city). So glad we spent time here yesterday evening devoid of the throngs. I’ve heard it’s really crowded in the season. 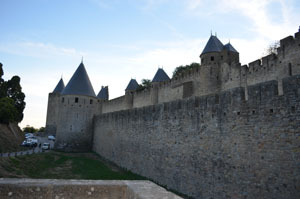 Carcassonne France is the largest medieval fortress in Europe. Fairytale like turrets, huge walls and beautifully restored (some say too beautifully). The view in the daytime is different and just as beautiful as at night. There’s an outer wall, an inner wall and the medieval town inside. The Romans built a fortress here in the 2nd Century BC. The new (12th Century) fortress was built on top. You can see the original Roman walls at the bottom of the inner walls. The outer walls were added in the 12th century. This location was important because of it’s between the Atlantic and Mediterranean and the border of Spain. Within the fortress is Château Comtal, the castle. It also has a wall and a moat and a chapel. From the rampart walk there are beautiful views of the lower modern city and the countryside. We next toured the beautiful gothic St. Nazaire Church (Basilique St. Nazaire) which served the people who lived here in La Cite. Luckily we happened to catch a performance of an a cappella Russian choir, “Choeur Doros” singing Russian orthodox hymns. Their voices were very moving, the sound amazing in that church. Leaving town we drove west towards the Cathar castle at Peyrepertuse. 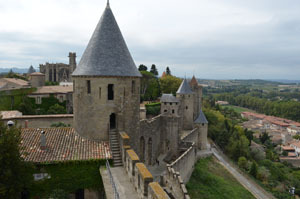 We stayed here in Carcassonne more time than planned because there was so much to explore. It was a beautiful drive through the valley surrounded by the grey rocky foothills of the Pyrenees. Different terrain than we’ve seen so far. The castle is built on the summit of one of these mountains. I love discovering remote parts of France and this seemed like one of them. The Cathars were a breakaway group from the Roman Catholic Church. They believed in non violence, non materialism, and sexual abstinence. They were vegetarian. The only sacrament they believed in was baptism. 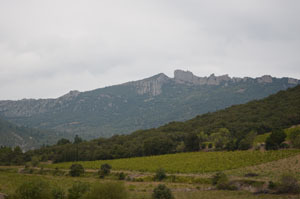 They were given refuge in the castles of the ruling guys of Languedoc-Roussillon, a very independent area at the time. Why should they need refuge? The Roman Catholic Church saw them as a threat aka heretics. The “holy” crusade against them started in 1209 and by the 1300s they were all obliterated. Peyrepertuse looms ahead high up in the distance as if it is part of the rock itself. We drove up winding roads surrounded by vineyards on either side. Once at the foot of it found an easy parking place and short walk to the tourist hut. With audio in English to guide me we hiked up and up and up and up arriving at the ruins of the castle. And then more up and down and around. 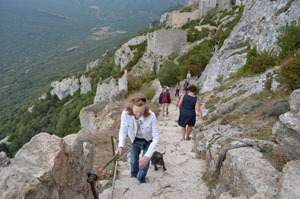 A French visitor had brought her little terrier who had a good time climbing and exploring with more energy than any of us. Stunning views from here even though it was overcast. On a clear day they say you can see the Mediterranean and Spain. Down at the car again and already 4pm we would not get to Cordes tonight where we had our B&B reservation. We cancelled and drove towards the coast for a hotel. The coast is a very busy place not only with tourists but businesspeople. 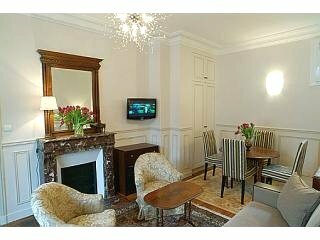 Knowing that Ibis Hotels are reliable enough we were able to get a room in Béziers. Ate dinner in a French sports bar type of place, the food good.